"Brooklyn's first boutique hotel," according to developer Dominic Tonacchio. Rooms at the Andres Escobar-designed Hotel Le Bleu at 370 Fourth Avenue will have iPod docking stations, glass-walled showers and 42-inch plasma TVs. Rates will run between $149 and $249 a night at the property, which is scheduled to open July 1st. The 48-room hotel is sandwiched between a taxi depot and an outpatient dialysis facility. Le Bleu's elements of high design--which also include a lobby enclosed in blue glass and a rooftop restaurant and lounge--seem somewhat incongruous on a Brooklyn avenue primarily known for its truck traffic and fast food joints. 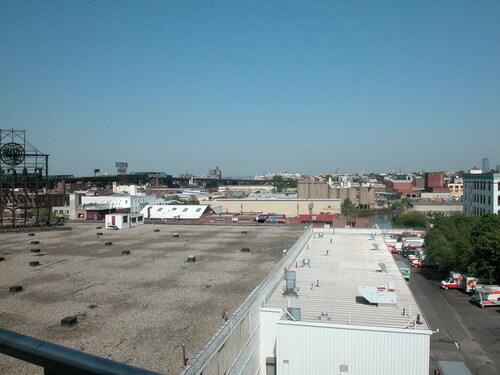 Finally, hotel rooms with Gowanus vistas.